Pair of Saxon 'saucer' brooches found by workmen digging in Oakland Park, Hanwell, in 1886. They are made from copper alloy covered in gold. The workmen uncovered a number of skeletons in seven graves on the site. The brooches were found still pinned to the remains of clothing on the bones. Saxon women were often buried with pairs of circular brooches. They wore one on each shoulder to fasten the tops of their dresses. 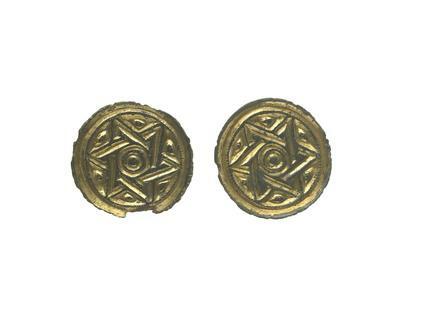 This type of brooch is common in Saxon graves in southeast England. Several examples of this design have been found in the Thames Valley so they were probably made somewhere in the Thames area.